A piece of string and a paper clip. 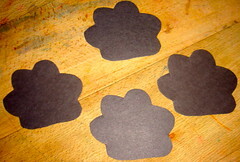 Step 3: Then we made cut out some black and white clouds from white paper. Step 4: And a weather chart would have to have lightening bolts. 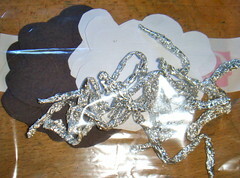 Roll or crunch a piece of tin foil into a thin strip, so that it looks like wire. Then bend it like a pipe-cleaner, any zig-zag way you like. 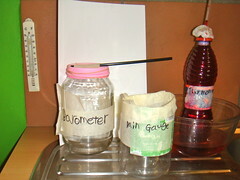 Step 5: We made some signs to point towards the different temperature conditions. 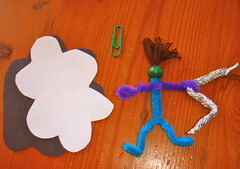 Step 6: And what would a weather chart be without a weather-person. 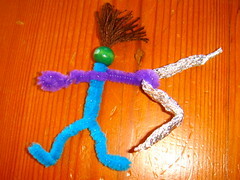 So we whipped up a pipe cleaner person put a lightening bolt in one hand and a paper clip backpack carries his cloud supply. Step 7: Finally putting it all together: Now the size really depends on how many participants you have and thank-goodness for blank doors!!! 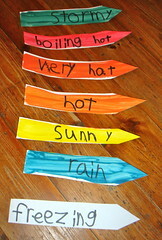 Rows of weather events, with a label pointed at them. And just hanging a piece of string (we used streamer) down and twisting it around the weather-person’s arm meant we could move him up and down the chart whatever the weather. And for us today is sunny to hot. 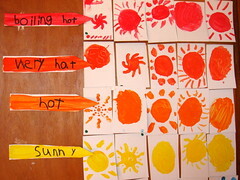 Weatherwizkids.com: A fabulous site… link on a topic on the left hand side and it will tell you all about it and link you on to activities, experiments and printables. 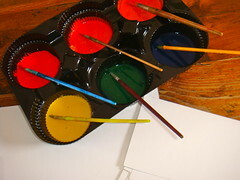 metoffice.gov.uk: This site has great things for kids to make and do. 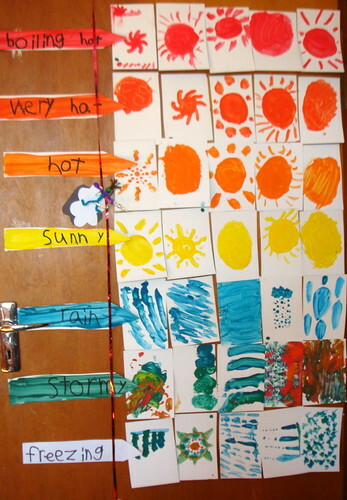 I really liked their printable weather diary. 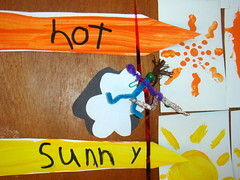 Illiniweather: Heaps of links to weather sites for kids. 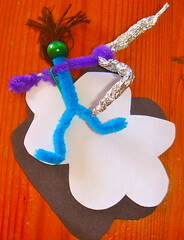 How Stuff Works: Cool weather projects for kids. 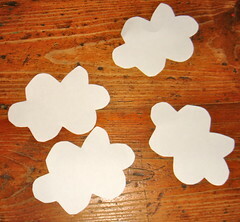 Family Fun: They make a weather station but they don’t have photo’s so the article won’t grab your kids, but they are very easy to implement and will be fun to make. Hay you, Glad you liked it!!! Everyone needs a comment like yours on a Saturday night!!! I hope you guys have a fabulous weekend! Oh Maggy, you are too kind!!! Thank-you so much!! !